I believe that one of the most important things to pay attention to when training horses is proper collection. This concept is probably the most misunderstood concept among a large number of (professional) riders. 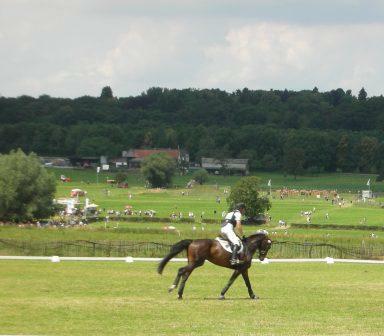 When I turn on the TV and watch a dressage show, or go into a barn and watch people riding, what I encounter most often is a wrong form of collection and/or not even an attempt to collect the horse at all. Thus, in either case no collection whatsoever. The first thing one usually does when trying to find out about a certain subject is googeling it and usually ending up at Wikipedia. Wikipedia claims that collection is “ when a horse carries more weight on his hind legs than on his front legs” (Wikipedia.com). This statement, even though it is heard most commonly when we talk about collection, is not correct! The horse cannot carry more weight on the forehand than on the hind legs, because in the front of a horse are the neck and the head located. I think that this mistaken statement has arisen due to the fact that it might look like the horse carries less weight on the forehand. This happens because the front legs of the horse are raised, while the pelvis of the horse tilts down (see section proper collection for a more detailed explanation). Another definition works out better: “Collection is the bringing together of both ends of the horse for the purpose of lifting and lightening the forehand”(TodayHorse.com). In this definition, one of the main goals of proper collection, the lightening of the forehand, is brought forward, without implying anything about physical weight being carried on the forehand. Before I will explain what proper collection is (in my next post – the article got really long all of the sudden when I was writing it, so I had to divide it in two posts), I will first introduce the opposite: contra collection. This term has been introduced by a dear friend of mine Josepha Guillaume. Much of my understanding of contra collection (and collection in general) is actually derived from her cliniques and her horses (all of them teaching me a lot). By understanding what contra-collection is (and how it comes about), I feel that one can more easily understand and even better value true collection. To make the connection more clear in the text, the contra-collection aspects are written in bold letters, while the opposite aspects of proper collcetion are written in italics. In my opinion, contra collection has to do with how a horse is being ridden. I believe that it is only because of us that a horse will ever walk in contra collection.Young, untrained horses for example mainly walk in their natural, horizontal balance. Contra collection happens when the horse is ridden from “front to back” instead of from “back to front”, or in other words, when the horse pulls himself forward with the forehand (rather than pushing himself with the hindquarters). 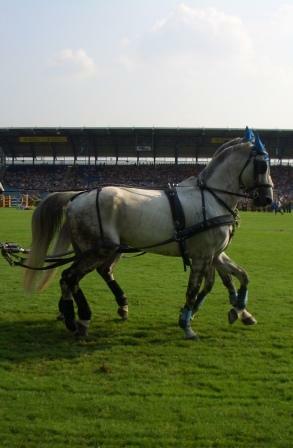 Often some form of “aids”, such as draw reins, running martingales, or tiedowns are applied to force the horse’s neck down. The problem is that all of these so called “aids” strengthen those very muscles that raise the horse’s head and drop the base of his neck. 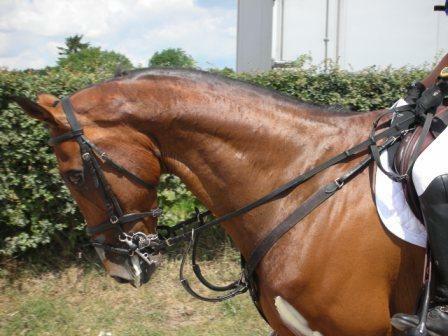 Thus, the horse ends up being even more high-headed and more restive with tighter back and loins muscles, than before. What exactly happens when we tie a horse down? By pulling the horse’s head down, we distort the balance system of the horse (which, just like in humans, is located between the ears). The horse actually feels like it will fall over; in order to prevent this from happening, it tries to pull its head up again (the lower neck muscle is contracted(rather than the topline neck muscle). This also leads to a contracted back muscle (raher than a relaxed back muscle), which disturbs the horse’smovement and leads to unrhtymic gaits (rather than a rhtymic gait). Furthermore, it starts to fall on his forehand in order to not fall on his nose (muscles are contracted) (rather than a light forehand). By employing a strong hand or aids, the horse is forced into specific frame, which will produce, among other things, a shortened and stiff stride(rather than bent properly the joints of his legs), in which the horse’sshoulders aren’t raised. Furthermore, the hind legs will come out behind the horse and the front legs will be set more underneath the horse (rather than having the hind legs deeper underneath the body). Also, the back of the horse drops down (rather than being raised upward). Also, the horse will probably flex his neck at the centerline (rather than at the poll), which leads the horizontal/straight line to rotate downward in the front (rather than rotate upward). The horse will carry the weight on the forehand with the longissimus dorsi, the shoulders, the lower neck muscles and the front legs. A horse that has been rideen in such manner has a very specific composition: the lower neck buldges outward, there is an unnatural bend on the topline of the neck(extreme S shape), the shoulders are heavily developed while there islittle muscle on the hind legs nor on the topline of the neck, the withers are tugged in and the longissuímus dorsi is so tense that the horse cannot maintain proper rhytem in the gaits. I would like to briefly introduce two examples. in the first example I will explain what happens when the horse’s neck is forced down, while the second example very briefly explains what happens if the horse’s neck is forced too much upward. If the horizontal line falls to the front (the bit is underneath the hip line) and the horse is asked (usually with spurs) to engage his hind legs by placing them well underneath the body, than the horse’s back will be pressured upward, leaving the hind legs lightened (total opposite of the proper collection). This will also result in the horse’s energy to be waste by him trying the reach the ground and lose balance. Another example, opposite of lowering the head, is erecting the head. 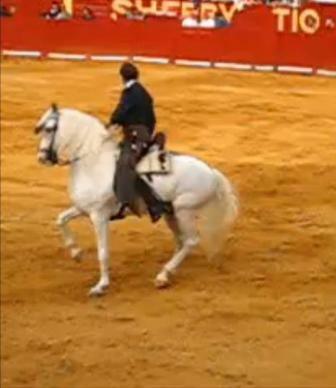 In this case, the horse doesn’t adequately bend his joints in the hind legs and the back becomes pressured downwards. In neither one example can proper collection be achieved. –> All in all, what happens is thus the exact opposite of collection, hence the name: contra-collection. Also, this form of contra collection will, in the end, lead to pain and injuries of the horse (especially the neck and the forehands, as well as the back). Examples are sore stifles, sore back, kissing spine syndrome, lameness, and all sorts of front end problems. Click here to check out some really good pictures that help you understand the problematical parts.